The global mass flow controller market has been prognosticated to be characterized by the presence of scores of powerful players. Key companies operating in the market could be engaged in a tough competition based on product innovation, quality, support services, price, and performance. The market could include prominent companies such as Brooks Instruments, Bronkhorst High-Tech B.V., Parker Hannifin Corporation, MKS Instruments, and Horiba Ltd. Transparency Market Research (TMR) has published a new report on the market which gives a broad account of some of the crucial growth factors, restraints, and business opportunities about to show face in the foreseeable future. 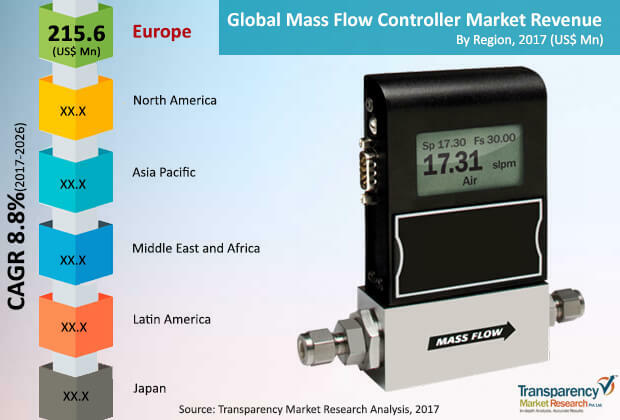 According to TMR, a revenue valuation of US$1.3 bn could be achieved by the global mass flow controller market by the completion of 2026 at a CAGR of 8.8% during the forecast tenure 2017-2026. In 2017, the market had attained a valuation of US$0.6 bn. As per type of product, the coriolis mass flow meter segment could account for a larger share in the coming years. By region, Europe has been anticipated to take a lion’s share of the market while earning a US$0.4 bn by the end of the forecast tenure. The world mass flow controller market has been prophesied to gain a whole lot of momentum in its growth with the rising application of water and wastewater treatment. While reducing plant operation cost, the installation, application, and operation of mass flow meter could enhance product efficiency and quality. This helps mass flow meter to accomplish everything from determining disinfection gases to monitoring air or gas flow in digesters and aeration systems. On the global platform, the demand for mass flow controller could gain a high significance due to the rising requirement of continuous emission monitoring system (CEMS) for reporting, recording, and collecting data associated with the emission of gasses. The increase in developments and innovations in the semiconductor industry has been expected to create ample of opportunities in the world mass flow controller market. The very function of mass flow controller in providing one of the most cost-effective and precise ways of controlling gas and liquid flow could augment the demand in the near future. The offset created in flow management due to variations in the differential pressure of mass flow controller could hamper the demand in the international market. Moreover, the rise in strategic component price has been predicted to slow down the increase in the demand for mass flow controller. The mounting position of mass flow controller could be another factor deterring market growth. However, profit-making applications of mass flow controller in a range of industries such as metals and mining, semiconductor, and chemicals could counterbalance the loss in growth for the coming years. Furthermore, new applications of ultra-low flow rate mass flow controller in a number of medical and industrial fields have been foreseen to set the tone for a valuable growth of the market.